nyc trip photos – voices of baha | doberman pizza. ever wonder how I got my start singing? it was with Voices of Bahá at their Carnegie Hall concert in June 2002. I never posted any pictures I took during that trip – until now. 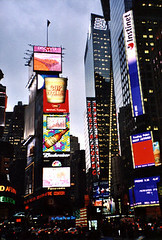 go see the new york city photoset on flickr. unfortunately I don’t have any pictures of the choir as such, but if people like this set enough, I might scan some of the other photos I took (there were a bunch of them). Addendum: I’ve also finished posting the gatineau park hike photos, from last month. Go see 90 photos from that photoset on flickr! This entry was posted in baha'i blog, by the way..., journal and tagged photos by danger. Bookmark the permalink.